My dad was a big Al Jolson fan. I’m not sure why. Maybe because Al Jolson was in the first ‘talkie’ movie and my dad was brought up in the 20s and 30s and loved going to the movies. He instilled in me a love for movies, too and a lot of time we spent together was in front of the TV or a theater screen watching Errol Flynn, Tyrone Power, Paul Newman and Steve McQueen. One of his favorite movies was The Al Jolson Story from 1946 with Larry Parks playing Jolson. I must have watched it 20 times growing up. In high school I did a paper about the Hollywood Blacklist and Communist scare of the 40’s and 50’s and discovered that Larry Parks had been blacklisted. He only made 2 movies in the 10 years after his name was smeared and died in 1975 of a heart attack at the age of 60. The more I found out about what happened during that time the more I was shocked. The country was gripped in a state of panic after World War II and some factions were able to ratchet up such a level of fear that just the innuendo that someone might be a ‘communist’ could ruin not just someone’s career but their lives and the lives of their families. Trumbo is based on what happened to writer Dalton Trumbo when he was blacklisted as part of the Hollywood Ten that refused to testify to the House Of Un-American Activities (HUAC) committee in Congress in 1947. They were convicted of contempt of court and went to prison. Then they were blacklisted from working anywhere as were many others, not just those who worked in Hollywood and the movies. Was Dalton Trumbo a communist? Yes. Was that a crime? No. But it was treated as a crime. 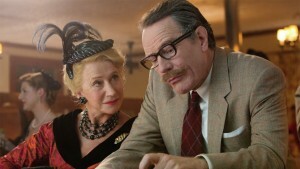 Even though Trumbo deals with a heavy subject it keeps it light. There are many moments of humor sprinkled in and it feels like a beginner’s course in the subject, preparing you for a more intense follow up (perhaps Good Night and Good Luck? 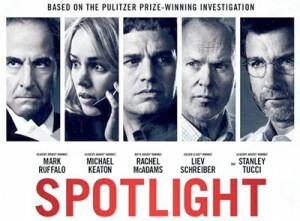 ), but that being said, it is a very entertaining film and that is largely do to the performances. Bryan Cranston can do no wrong these days. 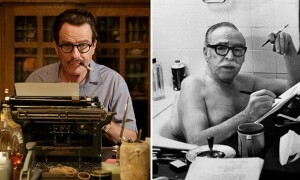 He is wonderful as the eccentric and witty Trumbo, sitting in a bath tub with a board laying across it holding his typewriter, working as he sits naked in the water. He was one of the most sought after writers in Hollywood and he knew he was good. Cranston sparkles with intelligence and determination as he struggles to keep supporting his family by continuing to write films under pseudonyms and fronts. His drive to keep working and to find work for the other blacklisted writers puts an enormous strain on his family. Diane Lane plays his wife, Cleo, who manages to keep it all together as Trumbo uses his children as hired help without the pay to answer phones and deliver scripts. Louis CK turns in a funny and touching performance as blacklisted writer Alan Hird. John Goodman does gruff and loveable like no one else and plays a C picture producer who knowingly uses Trumbo’s scripts on the cheap. Helen Mirren gets to play Hedda Hopper whose gossip columns regularly outed celebrities as ‘commies’. Michael Stuhlbarg plays Edward G. Robinson who is sympathetic to Trumbo and the others but whose own career gets caught up in it and he has to make a choice that haunts both men for the rest of their lives. Towards the end of the 50’s two bigger than life Hollywood players will step up and challenge the Blacklist and by the time the 60’s began it had been broken with a single frame of film. Trumbo is a good movie not a great one. But it should be seen because we all need to be reminded of how dangerous it is to forget what came before. How easy it is to succumb to fear and forget ourselves.